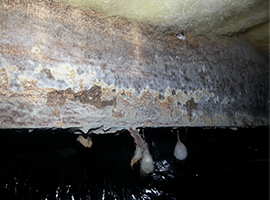 Molds are various types of fungi that grow in filaments and reproduce by forming spores. The term “mildew” is sometimes used to refer to some kinds of mold, particularly mold in the household with a white or grayish color or mold growing in shower stalls and bathrooms. Mold may grow indoors or outdoors and thrives in damp, warm, and humid environments. 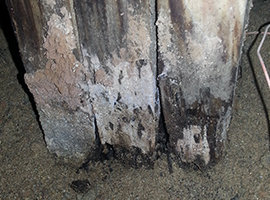 Mold can be found in essentially any environment or season. There are few common types of household mold. Black molds are the most dangerous and is a greenish-black mold that can be found outdoors as well as indoors. Most of the molds grow fed by household surfaces that have high cellulose content, such as wood, fiberboard, gypsum board, paper, dust, and lint. There are types of mold that can grow on substances as different as foods and carpet. Molds reproduce by forming tiny spores that are not visible to the naked eye. Mold spores are very hardy and can survive under conditions in which mold cannot grow, such as in dry and harsh environments. These spores travel through outdoor and indoor air. 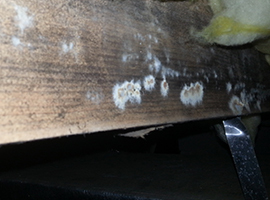 When the mold spores land on a surface where moisture is present, mold can then start to grow. Outdoors, molds play a role in the decomposition of organic matter such as dead trees, compost, and leaves. They are most common in damp, dark areas or areas of decomposing plant life. 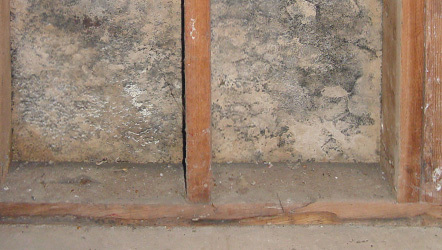 Indoors, mold is often found in basements or shower stalls. Indoor mold has the potential to cause health problems and can destroy surfaces and objects where it grows. Although shower stalls and basements are typical moist areas prone to the growth of molds, any mois area in the home can harbor mold. Drywall, ceiling tiles, carpets, furniture, ductwork, roofing, paneling, wallpaper, and the areas around plumbing pipes are examples of areas in the home that can become infested by mold if the requisite growing conditions are present. Mold from the outdoors can enter the home through open doors, windows, and vents. It may also become attached to clothing, shoes, and pets and therefore be carried indoors. Mold can have many different colors and sometimes appears as spots. Additionally, a musty odor may be present. 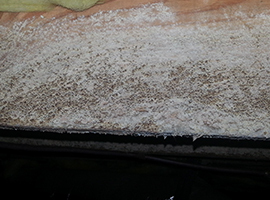 Mold growth may also be hidden underneath carpeting, on the back side of wallpaper, and behind drywall or paneling. Molds have been known to exist even in Antarctica, despite the extremely cold temperatures. They are virtually everywhere. HEALTH WARNING! DISEASES AND SYMPTOMS! MOLD ALLERGY! Molds are known to cause a variety of diseases, symptoms and respiratory problems, especially for people with preexisting conditions. We’ll go over some of the facts. Toxic molds known as mycotoxins have been linked to neurological problems that can turn fatal. Aflatoxin is a particular byproduct of mold that has been directly linked to cancer. It typically colonizes on various grains such as corn or wheat, thriving in high moisture conditions and high temperatures. In October 2007, Aflatoxin was found on recently harvested corn in Iowa and South Dakota. Although the U.S. Food and Drug Administration considers 20 parts per billion a safe level, the Aflatoxin discovered in those fields numbered from 20 parts to as high as 600 parts per billion. Some molds have been linked to specific cancers. Dr. Gary Schwartz, a cancer researcher from Wake Forest University, claims that testicular cancer can be caused by a mold known as Ochratoxin A. It starts when a fetus or infant is exposed to Ochratoxin A. The mold goes from the placenta to the child and latches onto his testicular DNA and remains dormant. When he reaches puberty, Ochratoxin A begins to affect testicular shape. Breast cancer may also have mold links. Aflatoxin has been found inside cancer-infected breast tissues in Southeast Asia. Other mycotoxins such as cyclosporine have also been linked to breast cancer. Cyclosporine was actually used to form drugs to treat renal cancer but was found linked to cause breast cancer in 18 of 598 patients studied, according to the Mold Help website. Molds produce irritating substances that may act as allergy-causing in sensitive individuals. Furthermore, some molds produce toxic substances. Mold may not cause health effects or it may lead to symptoms in people who are sensitive to molds. Allergic reactions to mold are the most common health effects of mold. Allergic reactions may happen immediately or could develop after a period of time following exposure. Both growing mold and mold spores may lead to allergic reactions. Symptoms of mold allergy may include sneezing, runny nose, coughing, wheezing, tearing and redness of the eyes, and skin irritation or rash. Asthma attacks may be caused by mold or mold spores in people who have asthma. Even in some nonallergic individuals, mold can irritate the eyes, skin, and airways. For example, the “black mold” along with some other types of mold, produces toxins that can cause irritation of the skin and airways in susceptible individuals. In some cases, people develop severe reactions to mold exposure. Symptoms of such less common include fever and difficulty breathing. People with compromised immune systems or those with chronic lung disease can develop serious infections of the lungs due to molds. There is sufficient medical evidence found to link indoor exposure to mold with upper respiratory tract symptoms, cough, and wheezing in otherwise healthy people. Mold is linked to the worsening of asthma symptoms in people who have asthma. Mold links were reported to hypersensitivity pneumonitis in individuals susceptible to this immunologic condition. This uncommon disease is similar to pneumonia and can develop in susceptible individuals after brief or prolonged exposure to mold. Risk may also depend upon the extent and exact type of mold that is present. HOW CAN MOLD IN THE HOUSEHOLD BE PREVENTED? The best way to prevent mold in the home is the control of moisture! Although it is impossible to eliminate all mold spores in an indoor environment, the mold spores will not grow in the absence of moisture, so controlling moisture is the key to preventing mold growth. Leaks in plumbing or other structures that lead to moisture buildup should be identified and repaired. Areas of leakage and water damage in the home should be cleaned and dried within 24-48 hours. Avoid the use of carpets in humid basements and bathrooms if possible, otherwise monitor regularly. Using fans and maintaining good ventilation in the home can also help prevent or control dampness. Mold inhibitors can be added to household paints to make them resistant to mold development. Keep indoor humidity at proper controlled levels to assure good air quality and to prevent spores growth. Use bathroom fans or open bathroom windows when showering to avoid high humidity levels. Appliances that produce moisture, such as clothes dryers and stoves, should be vented to the outdoors when possible. SHOULD WE TEST FOR MOLD? When mold has been suspected or identified – sampling, testing and inspection may be performed by qualified professionals to assure proper cleaning and prevention procedures as well as safety for your home. Mold cleanup procedures are somewhat dependent upon the extent of contamination and the type of surface that has been contaminated. Always use the services of a professional contractor who is skilled in mold cleanup and remediation. Hard surfaces that harbor mold may be scrubbed with detergent and water, and these should be dried completely. Porous or absorbent materials (such as cloth, ceiling tiles, carpets, etc.) may have to be discarded if they become moldy. In many cases stronger commercial cleaners may be needed to kill the mold. After mold removal, it is important to prevent further regrowth of mold by keeping affected areas as dry as possible while actively and continuously monitoring the air humidity levels.